Wishcare brings you unroasted coffee beans from an award winning family-run coffee farm specializing in specialty grade coffee beans. These coffee beans are carefully selected by specialists who has over 30 years of experience in the coffee industry so that they only source AAA high quality grade Arabica beans. There is health wave coming nation wide as so many are discovering the wonderful delights of fresh unroasted green coffee. 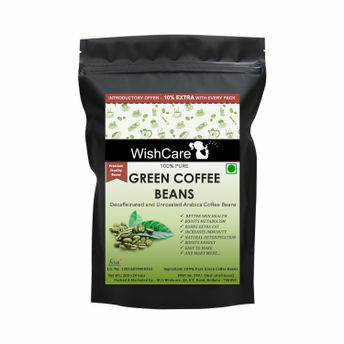 Wishcare brings you 100 percent natural green coffee beans which is simply the raw, unroasted, fresh version of the coffee you drink in the morning. They contain a naturally occurring active compound called chlorogenic acid(cga) which has been shown in clinical studies to aid in weight management by reducing the absorption of simple carbohydrates from the digestive tract and have a positive effect on health and well-being. Within every wishcare green coffee bean's heart is a collection of locked secrets.